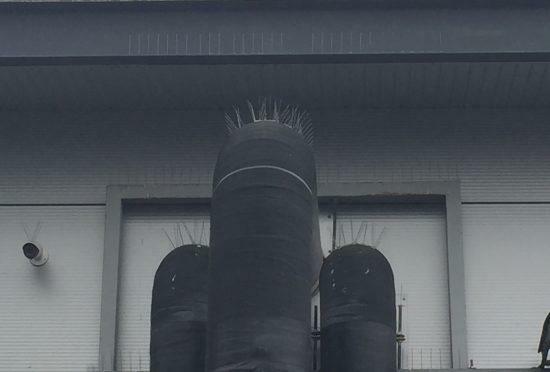 Bird spikes are discreet and if installed correctly should be hard to see from a few meters away. Total Pest Control have under taken both large and small jobs where spiking systems have been successful.The system does not harm the birds but does prevent them from landing. 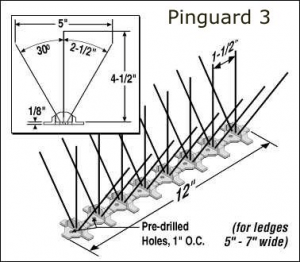 Bird Spikes can be used to proof a variety of surfaces from ledges, pipes, gutters, beams, cables, roof tiles and parapets. As there are so many types of spiking systems on the market they can be used in almost any type of pressure scenarios from light to heavy. The first line of point proofing wire should be set 25mm in from the leading edge of the ledge. Parallel lines of point proofing should be installed at a maximum of 65mm from the previous line. To protect the full depth of the ledge the system should be within 65mm of the rear of the ledge. If you are interested in our Bird Spiking for your business, or if you have any further queries, please get in touch using the buttons below.